The comedy in Hardwicke House was both black and slapstick, with a lot of the laughs coming from situations that might seem more at home in a copy of the Beano. People were dangled (and dropped) down stairwells, electrocuted and much more besides, but it was generally all done in a cartoon violence way, rather than anything overly graphic. So why all the fuss? None of this sounds particularly bad? Well, the main reason had to be the time at which ITV decided to show the series. Putting it on at a pre-watershed time of 8.30 meant kids could be well expected to see it, and this was probably the main concern of those who complained. Had it been shown at a later time slot (say 10pm) it would probably have aired without issue. Cancelled it was though, in a spectacular piece of back-stepping on the part of ITV. A planned second series was immediately canned, and the remaining five unshown episodes have never been aired (or released on video or DVD) to this day, which is surprising given the cult following the programme now has and the number of TV channels there are around these days for which Hardwicke House would be a perfect fit. If you want to see what all the fuss was about, you can see the two episodes on YouTube courtesy of filmnet (I’ve embedded the first part of the first episode below). Thanks go to my friend Phil for pointing me at the YouTube clips, and also to hardwickehouse.info for being a mine of background information on the show. This entry is filed under TV - Teens	and was posted on June 3rd, 2011. You can follow any responses to this entry through the RSS 2.0 feed. You can leave a response, or trackback from your own site. 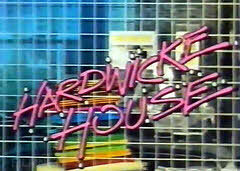 I saw Hardwicke House on transmission and thought it was rather good. The scene of the neighbours putting wire grills up over their windows as the school bell rang at the end of the day sticks in my memory. As yet I haven’t dared to see how it stands up today. I’m not sure ITV could have rescheduled it. IIRC 9pm was the home of hour long drama, 10pm was News at Ten and I wasn’t up later than that at that age.